A local legend says that the shroud in which Joseph of Arimathea wrapped the dead Jesus was brought here, and rested in the basilica until 1452. Marguerete de Charny, a descendent of a nobleman of Champagne who was said to have obtained it during the crusades, then presented it to the Cathedral at Turin. Strange though this story might sound, and although there is no proof that the shroud was ever near Cyprus, there is proof that in 1349 Geoffrey de Charny, a French knight, is already in possession of the Shroud, which some believe he acquired in Constantinople. And in 1453 Margaret de Charny, at Geneva, receives from Duke Louis I of Savoy the castle of Varambon and revenues of the estate of Miribel near Lyon for ‘valuable services’. Those services are thought to have been the bequest of the Shroud. Best of all. The above entry is cited in a Wikipedia article. (Yes, Google lets you trace citations backwards). See how some Wikipedia writer garbles the text from a travel brochure and plants bad history into an encyclopedia. According to legend, the shroud of Joseph of Arimathea was once held in the monastery and was taken to Turin, Italy, in 1452 where it remains today and is now known as the Shroud of Turin. 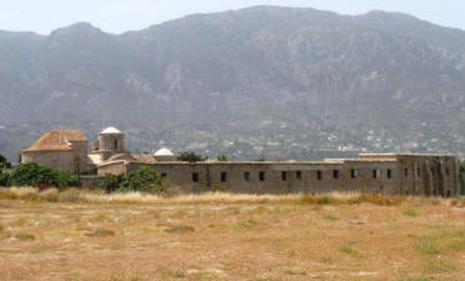 Although within the military area and cannot be visited, a good view of the monastery can be had from the Lambousa peninsula. Take the coast road from Girne towards Lapta. Around half a mile after the turning for Alsancak, look for a road on your right signposted to the Camelot beach complex. You will also see the signs for the churches of St Evlalios and St Evlambios. Before reaching the Camelot car park turn left on to the peninsula, and you will see the monastery just beyond the church. Remember, although you are on a public area, the monastery is within the military area, so take care where your camera is pointing. CF:So what do you think about the legend that Belsdon Scott has in his book on the Shroud (pp.32- 33) that Patriarch Heraclius of Jerusalem gave the Shroud to the king of Cyprus in 1087 and it was kept on the island until the Turks overrran Cyprus. Then Margarite de Charny escaped with it and the reason that the Savoys were keen to have it was that the duke of Savoy’s wife Anne of Lusignan came from a family that had claimed stewardship of the holy places of Palestine as well as the crusader kingship of Jerusalem. All quite plausible, don’t you think? Me:Plausible, yes. It is plausible that Shroud spent some time on Cyprus on one point of its complicated history -but not necessarily at the precise time and circumstances that legend says. We will discuss it another time. The Templars were also in Cyprus. 1st Place Book Award for Follow the Light, The Shroud’s Revelations Manoppello, Shroud and Durer: A Short Presentation by O.K.